Design your own storage solution. These attractive designs will fit anywhere and hold anything. 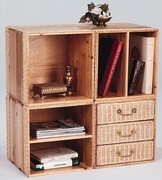 Our sturdy cubes are made of wood with a hand woven wicker trim. Cubes are designed for easy stacking. 15"W x 15"D x 15"H and available in Natural finish.